(INQUIRER.net) MANILA, Philippines – Airbus exceeded commercial targets in 2013, achieving a new record of 626 aircraft deliveries (493 A320 Family aircraft, 108 A330, 25 A380) to 93 customers (15 new) and a new industry record of 1619 gross orders (377 A320ceo, 876 A320neo, 77 A330, 239 A350 XWB, 50 A380) beating the previous record in 2011 by 11 aircraft, it said in a statement. The year was also Airbus’ most valuable gross order intake (List price US$ 240.5 billion). By year end, the backlog had climbed to an industry wide record of 5,559 aircraft, valued at US$ 809 billion at list prices, or eight years production, it said. At 2013 year end, Airbus commanded 51 per cent gross market share (aircraft above 100 seats). Decisions by customers to move towards larger aircraft in all segments (A321, A330-300, A350-1000 and A380) is having a positive result on revenues, complementing Airbus’ lead in both single aisle and widebody aircraft markets, it said. 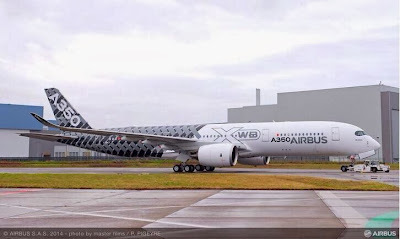 Signalling Airbus’ successful transformation to a more agile company, 2013 was also notable for the A350 XWB first flight. Test flights are progressing well with two aircraft having accomplished over 800 flight hours. Certification is targeted for Q3 and Entry Into Service for Q4 2014. The A330 new longer range and regional variants were launched, A330 production reached a new record high of rate 10 per month and single aisle remained stable at rate 42. In 2013, Airbus Military delivered 31 aircraft, including seven A330 MRTT and two A400M for the French Air Force, confirming the program is well back on track. “I thank the Airbus teams for these great achievements. The transformation of our company into a simpler, more agile and faster one is clearly taking shape. We are producing aircraft at all-time-highs and selling our market leading products at record levels,” said Fabrice Bregier, Airbus President and CEO.